In this episode, we look at the lengths we go to clear the way for our youth, robbing them of opportunities to learn and grow from failure. 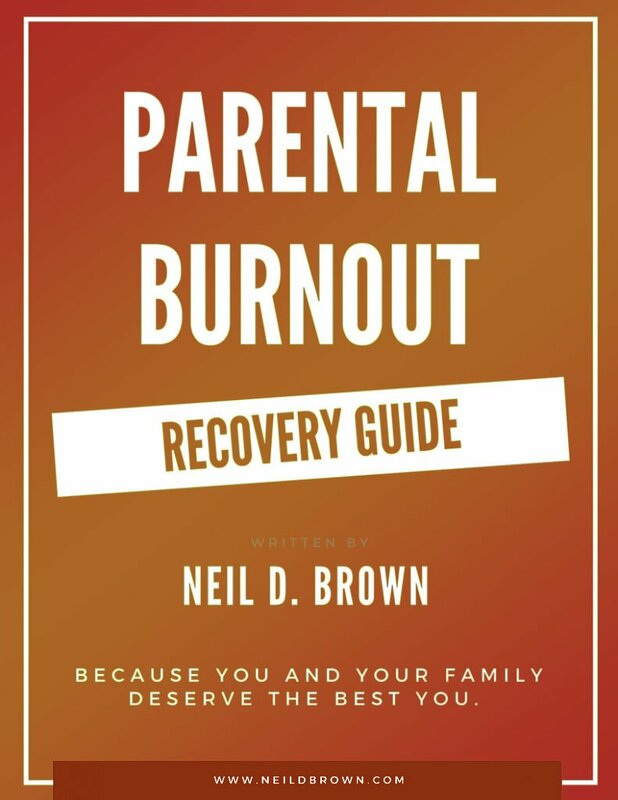 This is podcast #101 and to celebrate hitting 100, I’m having a drawing to give away 5 copies of my book, Ending the Parent-Teen Control Battle. To enter, all you need to do is leave a brief review of the Healthy Family Connections Podcast on iTunes and then go to my website, neildbrown.com and send me an email telling me you did, and we’ll enter you in, easy-peasy. The drawing will be April 10th so there is still time. While there have been some reviews going up, I haven’t received any emails so I won’t be able to get your address to send a book. So if you enter, be sure to send me an email and chances are, you’ll be getting a signed copy of my book. The current college admissions scandal is a horrible example of the opportunity gap between the connected wealthy and the rest of us. Yet I think it reveals something more subtle that’s worth our self-reflection. Let’s start with acknowledging that we all want our offspring to be happy and successful. And that’s a good thing, right? But how do we help our kids find happiness and success? We all experience challenges so let’s look at the essential elements that our children will need to create happiness and success. Happiness and success come from the application of skills. Sure, I know, some of you are going to tell me that one of your children was born with a happy disposition and the other entered the world moody and dour. One of your children was self-motivated with goals and another was lazy and never wanted to do anything. And while that may be true, it isn’t the full story. All of us have our own temperament that’s genetic in origin. Our level of sensitivity, competitiveness, extroversion or introversion and many other traits are in our genes. But we need to be more than our temperament. We need to learn about ourselves and grow. Otherwise, our strengths will become weaknesses and we won’t develop or improve in our areas of relative weakness. For instance, the shy kid won’t learn how to make friends and socialize. The very social kid won’t learn how to spend time with themselves. The competitive kid will become a bully, and the non-competitive kid will always defer or accommodate. My point here is that to develop happiness and success, we need happiness and success skills and no, it isn’t all genetic. We have to learn how to utilize our strengths and improve in our areas that are inherently less strong. When parents understand their child’s essential temperament, love them for who they are, and put structures in place that allows them to grow their strengths and deal with their areas of relative weakness, every child can grow to be happy and successful. Maybe the most important part of learning to be happy and successful is to have a growth mindset where we embrace challenges and learn from failure as well as from success. If we teach our children and teenagers that failure doesn’t define them, it teaches them that failure isn’t defeat. It’s just a next step on their wonderful journey. In other words, we can’t buy our offspring happiness or success. We can only support them in developing the skills to achieve it for themselves. So why in the world would someone pay bribe money to get their kid something their kid may or may not want, deserve, or be prepared to be successful with. Aside from the fact that what they did was illegal and unethical, which speaks to their character and lack of integrity, maybe what they did is something we all do and need to reassess. We love our kids to death, and we want nothing more for them but to be happy and successful. So we go out of our way to take all the obstacles out that might make them unhappy or that might lead to failure. The minute they’re unhappy or unproductive, we rush them to a therapist or get them on antidepressants. Do we confront the coach about not giving your kid enough playing time, or argue with the teacher, that your child’s grade is too low? I was talking with a grandfather who had his young adult grandson staying with him. His grandson was a bit lost in life and wanted to stay with his grandfather while he assessed his next direction in life. This grandfather and his lovely wife welcomed the young man into their home only asking that he be a reasonable guest and set and make progress towards some reasonable goals. One morning the grandfather asked his grandson to show him something on the internet and he responded with something like, “That sounds too much like work,” and walked away. Later the grandson said to his grandfather, “When I stayed with my aunt, she always asked me what I wanted for dinner.” That was his way of objecting to his step grandmother’s cooking. Whoever was raising this young man, did such a great job making him happy and clearing obstacles out of his way, that he didn’t grow emotionally or socially, and it has developed into a lack of moral development as well. Ironically, his parents robbed him of the ability to lead a happy, successful life. 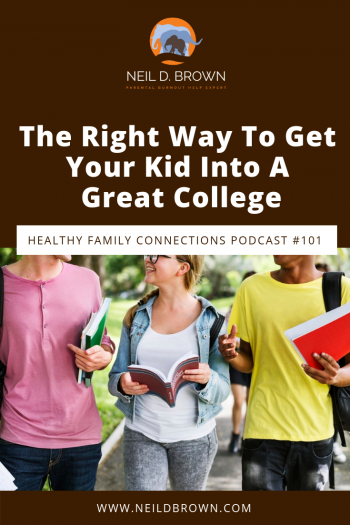 Let’s get back to the subject of getting your kid into a great college. Let’s start with what “great” means because “great” for one person may not be great for another. Your youth will thrive in a college that is best suited to them. I know lots of troubled adults who graduated from top competitive colleges. I also know lots of college kids who are wholly unprepared for being away from home at a four-year college and have found themselves in serious trouble emotionally, with substance abuse, and often with legal problems. Maybe a great college for your young adult is a local community college. Maybe it’s a small, little-known college that’s perfect for your youth. My first college experience was at a well-known private university and it was painful. Most of the kids had gone to private prep-schools and I couldn’t relate socially. Then when I transferred to a state university, I thrived. Listeners, I know I don’t need to warn you against paying bribes to advance your child’s or teenager’s opportunities. But let’s be aware of the temptation to make our youngsters happy at the expense of their growth and development. Having a strong character and integrity will advance their happiness and success far more than an unearned reward. And then when they get into a college, it will be a great college. ← How Do I Deal With My Critical Mother?